Rent to Own High Efficiency Furnace or Air Conditioner for special $49.99/m+hst. FREE Installation. FREE Repairs. Enbridge Billing Available. 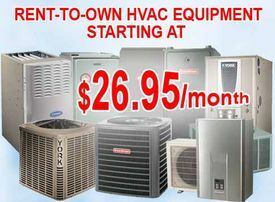 Our HVAC RTO prices start at just $49.99 per month+hst (!!! SPECIAL PRICE!!! FOR ONLINE CUSTOMERS THIS MONTH ONLY – BEST PRICE GUARANTEED) -often less than half what you’d pay for classic HVAC rental programs . or press the “Quote Me” button to fill out Online Form. Prefer to rent your HVAC equipment? Bad Credit? Click to learn more about our rental program.